The Total CREB kit monitors cellular CREB expression level and can be used as a normalization assay for the phospho-CREB kits. 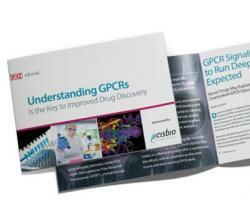 The Total CREB cellular assay monitors total CREB and is used as a normalization assay with our phospho-CREB kits. 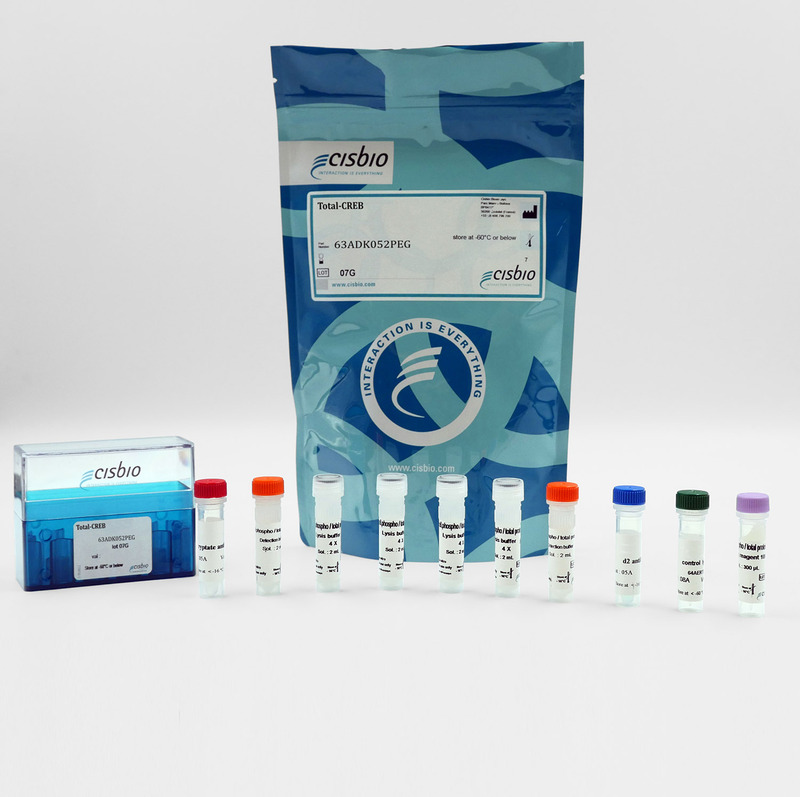 This kit is compatible with the buffers from the phospho-CREB kit, so the same lysate can be used for analyses of both the phosphorylated and the total protein populations. CREB functions as a transcription factor, signaling downstream from MAPK/ERK and activated by several pathways, such as MAPK/ERK, PI3K/AKT, and stress signaling. CREB plays a critical role in promoting neuronal plasticity, cognitive abilities, cell proliferation, survival, and glucose homeostasis. 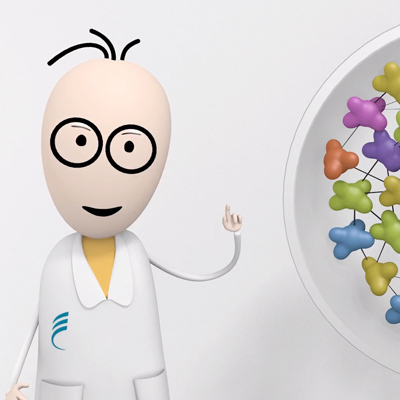 The Total-CREB assay quantifies the expression level of CREB in a cell lysate. Contrary to Western Blot, the assay is entirely plate-based and does not require gels, electrophoresis or transfer. The Total-CREB assay uses two labeled antibodies: one coupled to a donor fluorophore, the other to an acceptor. Both antibodies are highly specific for a distinct epitope on the protein. In presence of CREB in a cell extract, the addition of these conjugates brings the donor fluorophore into close proximity with the acceptor and thereby generates a FRET signal. Its intensity is directly proportional to the concentration of the protein present in the sample, and provides a means of assessing the proteins expression under a no-wash assay format. The 2 plate protocol involves culturing cells in a 96-well plate before lysis then transferring lysates to a 384-well low volume detection plate before adding Total-CREB HTRF detection reagents. This protocol enables the cells' viability and confluence to be monitored. 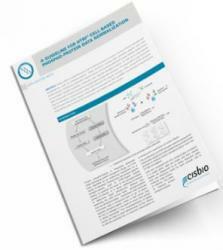 Detection of total CREB with HTRF reagents can be performed in a single plate used for culturing, stimulation and lysis. No washing steps are required. This HTS designed protocol enables miniaturization while maintaining robust HTRF quality. Mouse pancreatic ß-cells Min6 are seeded in culture-treated 96-well plates at 70Kc/well and cultured for 6 days in complete culture medium at 37°C, 5% CO2. After a cell washing step with KRB (Krebs Ringer Buffer) and a quiescence step for 2h in KRB, cells were stimulated with 50 µL KRB and increasing concentrations of Glucose for 5 min at 37°C. After a 30 minutes lysis incubation time, total and phospho-CREB were measured using the two-plate assay protocol. Human embryonic kidney cells HEK293 are seeded in culture-treated 96-well plates at different cell densities/well in complete culture medium and incubated for 24 hours at 37°C, 5% CO2. Cells were then lysed with 50 µL of supplemented Lysis Buffer #1 for 30 min at RT, after a 30 minutes lysis incubation time, total CREB was measured using the two-plate assay protocol. The assay presents a good sensitivity allowing the detection of total CREB on 25,000 cells (S/N = 5). The excellent linearity of the assay allows total CREB to be detect in cell densities varying from 25000 to 200,000 cells/well. 8 million Hek293 cells were cultured and stimulated with 50 µM Forskolin. Following cell lysis, soluble fractions were then collected and centrifuged. 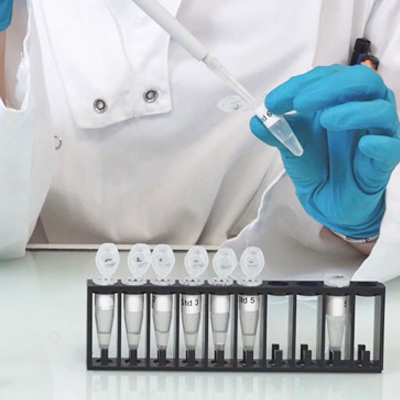 Serial dilutions of cell lysate were performed in the supplemented lysis buffer, and 16 µL of each dilution were dispensed and analyzed side-by-side with Western Blot and HTRF. 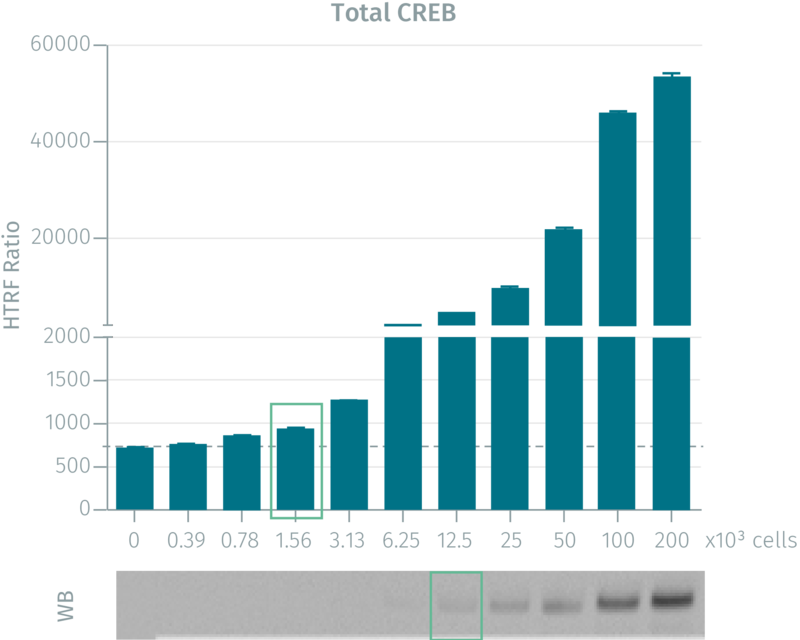 The HTRF total-CREB assay is 8-fold more sensitive than the Western Blot and shows optimal correlation. CREB is a bZIP cellular transcription factor that activates transcription through cAMP response elements. 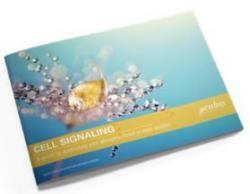 CREB is able to mediate signals from numerous physiological stimuli, resulting in the regulation of a broad array of cellular responses. CREB plays a key role in promoting neuronal activity. Additionally, CREB signaling is involved in learning and memory, cell proliferation and survival, glucose homeostasis, spermatogenesis, and the circadian rhythm . CREB is activated by phosphorylation at Ser133 by various signaling pathways including Erk, Ca2+, and stress signaling. Some of the kinases involved in phosphorylating CREB at Ser133 are p90RSK, MSK, CaMKIV, PKA and MAPKAPK-2.